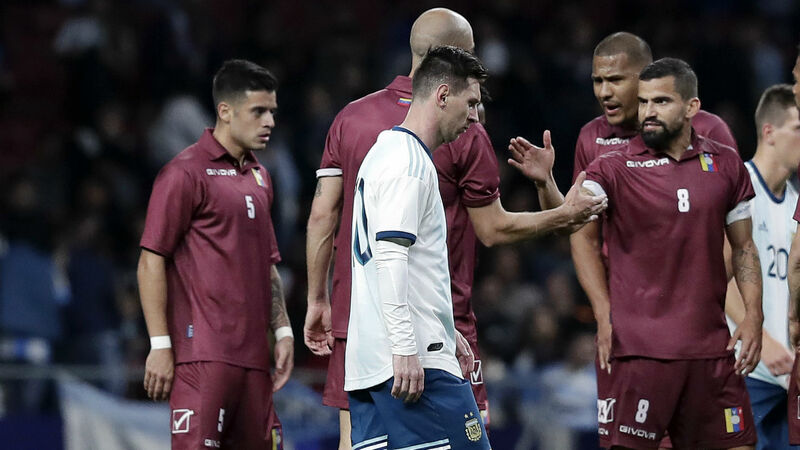 Diego Maradona labelled the Argentine Football Association's (AFA) president Claudio Tapia as "inept" and believes the team that lost to Venezuela is not fit to wear the Argentina shirt. The build-up to Friday's game was dominated by Lionel Messi, who returned from his self-imposed post-World Cup hiatus for the friendly at Atletico Madrid's Wanda Metropolitano. But Argentina were ultimately well-beaten, as they lost 3-1 to Rafael Dudamel's side despite Messi playing the full game. Argentina icon Maradona did not spare the players from his criticism, however his ire was mostly directed at those in charge. "I am very Argentine and I feel like I am part of a different group of coaches and players," he told reporters. "I know what [Oscar] Ruggeri, [Gabriel] Batistuta, [Claudio] Caniggia are thinking… That this team doesn't deserve the shirt. The ones I named had the shirt tattooed on. "Those who are inept and are running the AFA thought that they would win against Venezuela? Venezuela are a proper team and Argentina came into this through the window, not the front door, because they betrayed and constantly lied to people. "I'm sorry, but Argentina are not going to win a game. I don't know what Tapia will be, if he will be a maths teacher or what, but he has no idea [what he is doing]. "I'm sorry for the Argentine public, who continue to believe these liars. I'm sorry for the players who have to show their faces when they shouldn't have to. "It should be the leaders who start doing things right. "Messi has to ignore the critics. It's not his fault, he's in a bad, disorganised team, a team that always depends on him in every way. "He's an amazing and extraordinary player, he's got nothing to prove to anyone." Argentina return to action on Tuesday against Morocco in Tangier, although they will be without the mercurial Messi due to injury.